Infographic CV makers – Are they any good and which one to use? Representing yourself professionally online has become more important than ever before. Yes, you can say how social media pages are most important, and it’s no secret that every employer will search your name before they hire you, but is that all you can do? Of course not! Today we want to show you how can you make an impressive graphic CV, which can be a good contribution to your standard CV, printed or online. If nothing, you will get another resource on Web to pop out when searching your name. In general, Infographics become very popular in last couple of years, simply because “the picture replaces 1000 words”, and it’s no surprise how they become an instant trend on social media networks, like Facebook or Pinterest. Of course, as always, some creative individuals took an advantage in it’s simplicity and originality, and made a CV that stand out in a labor market. To find out more, about these examples, we recommend you to read a great blog post by Coolinfographics.com. Or to get inspired take a look at this Infographic CV gallery at Pinterest. Unfortunately, not everyone is skilled enough to make it’s own infographic CV, or we just don’t have time to do it, but recently we are facing a growing trend of websites which help users to make one for free. Basically what these pages do is that they let you import all of your information which you would put in your standard CV and transport them into graphic form based on your preferences. In the next couple of sections we will describe three most popular websites, and hopefully help you decide which one fits you the most. Of all three websites, that we are talking about here today, Kinzaa could be described as most detailed, and least graphic friendly. After you sync your profile with LinkedIn, Kinzaa allows you to determine the percentage of your skills and personality regarding various fields of interest. For example, you can rate the most important skills of yours on a scale from “Average” to “Expert”. This feature is pretty detailed and it allows viewers to get a better insight of your personality before they even met you, but rating your self isn’t an easy task, especially when the rate points are not “locked” but free to position where ever on a scale point. Besides rating your self, in your job description, Kinzaa allows you to place a small pie chart with three main responsibilities that you’ve done at specific job place. Now, this a neat feature, since it allows a viewer to find out about your job position within seconds. It’s more straight forward oriented than describing your job position in a traditional way. Also, if you want, you can upload a video, add “Expected Benefits” or “Preferred Settings” for your next job position. In conclusion, even though Kinzaa is still a Beta project it looks very nice and while working with it you won’t face any bugs or any other technical problems. What we don’t like is the design of a page, which is sterile and unique for all the users, as well as the sharing option which allows you to recommend the page on Facebook or Twitter, but you’re free to share a standard link of your page wherever you want. 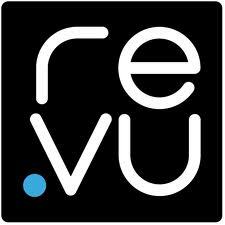 Re.vu is a very well done infographic based CV maker. It’s simple to use, synchronization with LinkedIn works as it should and afterwards you can make your own page layout based on suggested templates. In the following picture you can see a very rich selection of categories which can help you to organize your infographic CV in an accurate and most visual attention way. Timeline is the most important part of your Re.vu infographic CV. Not only that it shows your work experience time organized, but it’s also interactive. By selecting a specific job you’ve done, viewers can see a basic description of your work. Infographics section is the most detailed one, and it helps you to present your self visually in full sense of that word. Depending on your enthusiasm you can “play” with these functions a lot, but before starting you should be aware of your accomplishments and personal values. These features may be a little to detaile d, and may require a little to much of a CV making experience, especially if you’ve just become aware of branding your self importance. Sharing options are organized in a simple way, not too much options, but compared with Kazaa’s sharing options, it just lets you to share in a more easier way. For a conclusion, if you have more time to dedicate making your self an infographic CV, and if you are already skilled with effective CV making, while having basic sense for design, this is the best infographic CV maker out there. If you want to take a full advantage of all possibilities, it may be a “bigger bite”, but we couldn’t say it’s not user friendly. 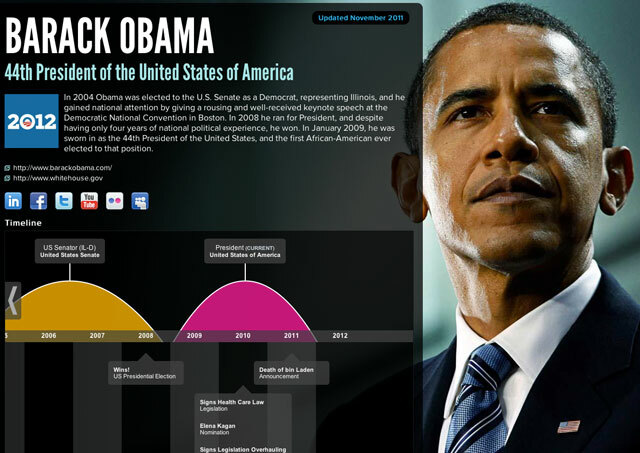 Take a look at Barack Obama’s Re.Vu CV, using just basic information. Not bad, right? 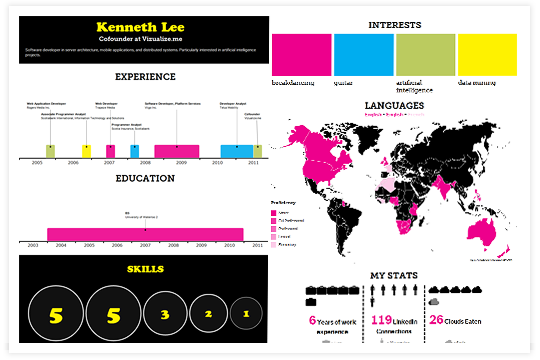 The last Infographic CV maker is Vizualize.me. And as it’s name says so, it’s all about visualizing your basic information and professional experience. At this moment you can choose between six different themes, and arrange colors and fonts as you like. Maybe it’s not creative as Re.vu, but it’s a lot more easier to make infographic cv, and the menus are user friendly all the way. As the picture on the left suggests, there are many different sections which can easily be edited and inserted to your infographic CV. As the other two infographic CV makers, Vizualize.me also allows to be connect with LinkedIn, which saves some time for importing your professional and personal background. The biggest advantage for basic users is the Share option. 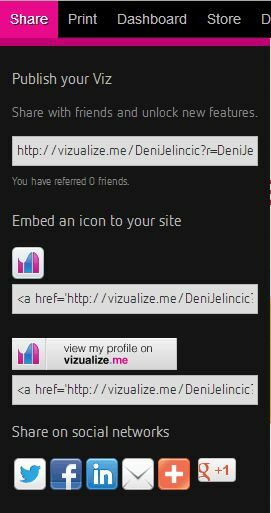 If you have a blog or any other personal website, you can easily embed an icon to your site, as shown at picture. Also, the sharing option included the highest number of different website plugins, so there is no chance your infographic CV won’t be shared on most popular social networks. And of course, you can easily get to the direct link of your profile, to share it wherever you want. 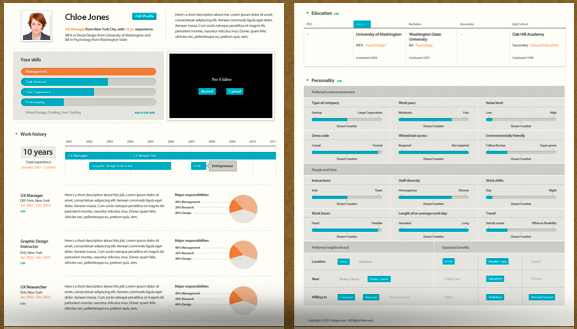 In conclusion, Vizualize.me is an easy infographic CV maker, featured with most relevant information needed in a CV. But, the bad side of it is the not that wide palette of designs and theme variations. Infographic CVs might help you stand out in a certain job market, but don’t rely on it too much. Well written standard CV is still an essential “brand card” of your professional career, and it should always be your first priority when applying for a job position. Having said that, it’s not forbidden to take some “risk” and show potential employer your creativity and courage to stand out.